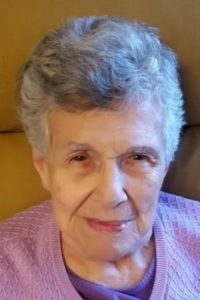 ROSE ELIZABETH PALUMBO (nee TROVATO), age 99, passed away September 20, 2018. She was preceded in death by her adoring husband of 60 years, Jerry; her loving son, Joseph; and her grandson, Michael. Born in Chicago, Illinois on September 7, 1919. She is the daughter of the late Frank and Louise Trovato. Beloved sister of the late Nick (Bessie). Cherished mother of Frank (Mary) Palumbo of Munster, Indiana and Kathy (Charles) Scheidt of Solon, Ohio, and wonderful mother-in-law of Louise Palumbo of Downers Grove, Illinois. Proud and loving grandmother of nine, great-grandmother of sixteen. Dear aunt and loyal friend to many. Rose will be remembered for her kind and gentle nature, her genuine love of family, and her abundant hospitality to all. She was the perfect role model for living a life of faith and gratitude. Mass of Christian burial Saturday, September 29, 2018 at 10:00 a.m. at St. Maria Goretti Church, 500 Northgate Dr., Dyer, Indiana 46311, where family will receive friends beginning at 9:00 a.m. Interment at St. Mary Cemetery, Evergreen Park, Illinois. In lieu of flowers, donations to honor Rose’s memory may be made to a charity of choice.